Masala Dosa or Masale Dose is a variant of the popular South Indian food. Masala Dosa is a thin crisp dosa, consumed with a spicy potato sabji. 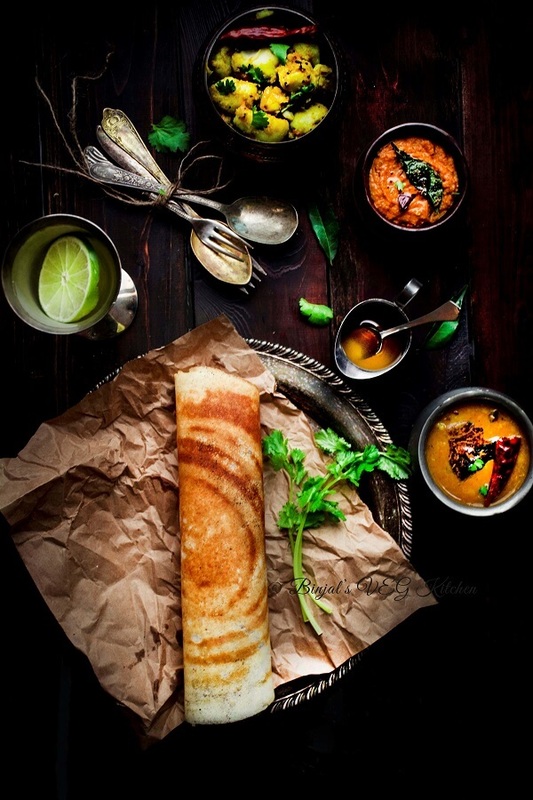 Masala Dosa is made from rice, potato, methi, curry leaves and served with Chutneys and Sambar. Though it was only popular in South India, it can be found almost in all other parts of the country, and even outside the country now. 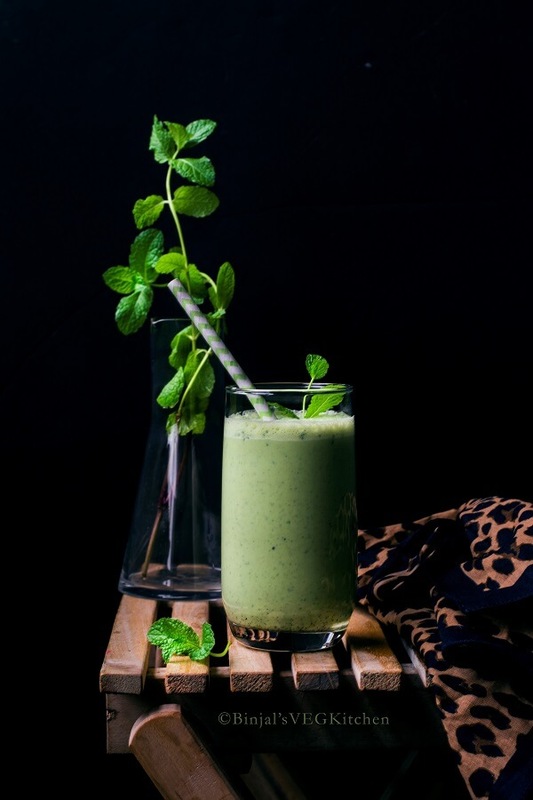 This popular South Indian dish has been listed as the ‘Top 10 Foods to Try before You Die’, according to a list compiled by the Huffington Post. The plate-covering, paper-thin pancake is made from rice and lentils, cooked to lacy perfection on a hot griddle. What creates the more flavor is a spiced concoction of mashed cooked potatoes and fried onions, served with a liberal dose of tomato chutney. This is the one food that I can devour for breakfast, lunch and dinner, or food that just comforts me or food that has satiated my hunger. Masala Dosa, sambar and tomato chutney are quintessential South Indian dish that have universal appeal. In India all age’s people as well as people outside of India are big fan dosa. 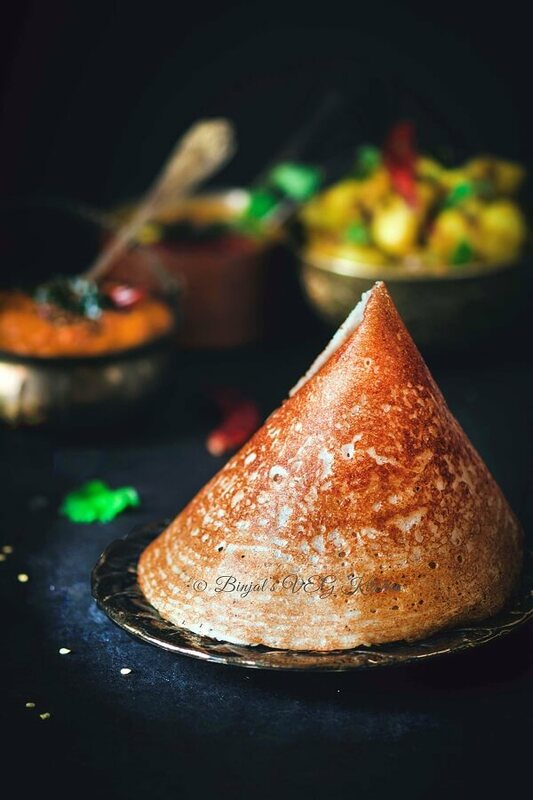 But making authentic, thin and golden crispy dosa or masala dosa can be needed passions, here’s an elaborate recipe of the masala dosa batter with step by step method that will help you make near-perfect masala Dosa! 1. Wash rice and dal separately for 2-3 times and soak them in a separate bowl with required water. Add methi dana into the soaked rice and cover it both bowls with lid up to 3-4 hours, keep aside in warm place. 2. Wash poha after 3-4 hours, add into the soaked rice and again keep aside for 4-5 minutes. 3. 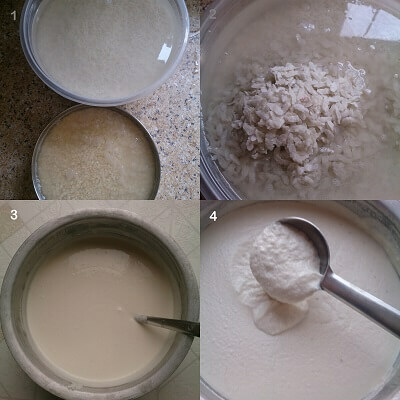 Now grind the rice and poha mixture into a mixer or grinder and make smooth batter/paste using little water, do not make thin consistency, make thick but pourable texture. Remove it into the big vessel or big mixing bowl. 4. Grind urad dal in the same mixer bowl and make smooth paste using little water. Add grinded urad dal paste into the rice batter, stir it, mix it well, cover it and keep aside in warm place for 6-7 hours or overnight till fermented. 5. After fermentation, add salt, pinch of soda and keep aside. 1. Heat oil in a pan/kadhai, add mustard seeds, cumin seeds, pinch of hing and then add urad dal, broken cashew nuts, chopped green chilies, curry leaves and stir it for few seconds. 2. Now add chopped onions, stir it till golden brown and then add grated ginger, grated carrot, again stir it for 2 minutes on medium flame. 3. 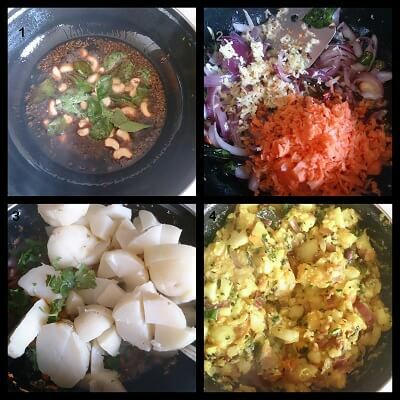 Add chopped coriander leaves, chopped potatoes cubes, turmeric powder, red chili powder, salt, sprinkle 1-2 tbsp water, mash the potatoes little bit, mix it well and cook it for 2-3 minutes. 4. Potato masala is ready, keep aside for serving with dosa. 1. 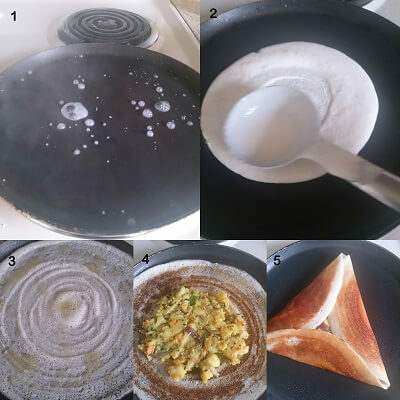 Heat an iron griddle/nonstick flat pan on medium flame to make dosa. Take the prepared batter mixture and mix it well with ladle or big spoon. 2. Now grease the griddle/pan with few drops of oil, then sprinkle few drops of water over the griddle, you can see the steamy bubbles, it should sizzle immediately. 3. Pour the big full spoon of mixture over the center of griddle and spread the batter with circular motion and make thin big circle shape dosa. 4. Spread 1 tsp of butter or ghee on the edges of the dosa and cook it till golden brown, crispy down side. 5. Now spread the prepared aloo masala evenly over the dosa using a spatula as per your choice and Fold over while pressing it lightly, using a spatula to make a flat roll, repeat with the remaining ingredients to make more dosa. • Add little water if require in batter for easily spread on griddle. • You can add 1 cup leftover cooked rice instead of thick poha for batter. Masala Dosa or Masale Dose is a variant of the popular South Indian food. 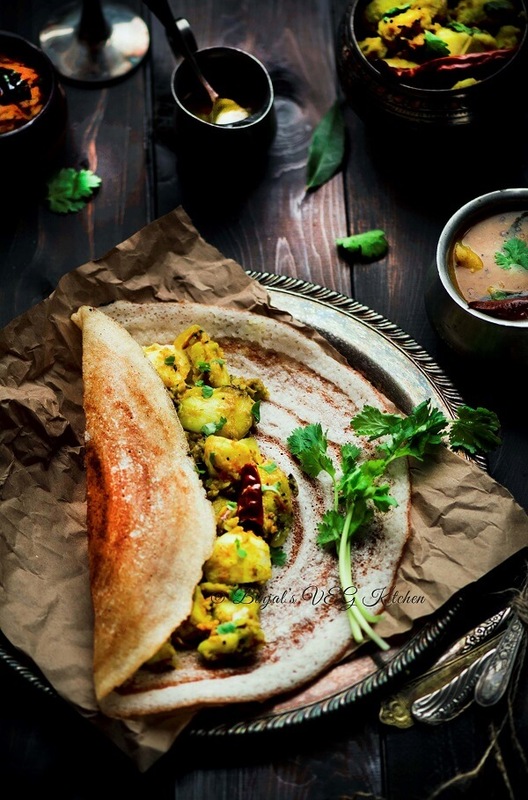 Masala Dosa is a thin crisp dosa, consumed with a spicy potato sabji. Masala Dosa is made from rice, potato, methi, curry leaves and served with Chutneys and Sambar. 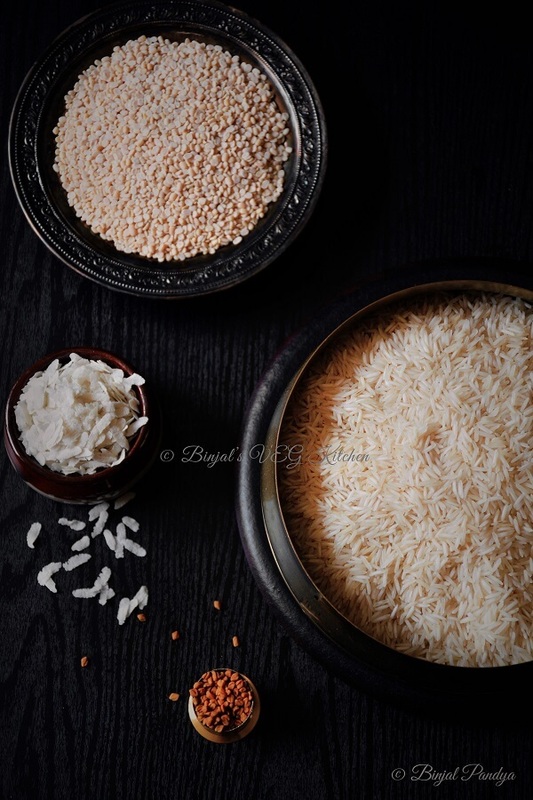 Wash rice and dal separately for 2-3 times and soak them in a separate bowl with required water. Add methi dana into the soaked rice and cover it both bowls with lid up to 3-4 hours, keep aside in warm place. Wash poha after 3-4 hours, add into the soaked rice and again keep aside for 4-5 minutes. Now grind the rice and poha mixture into a mixer or grinder and make smooth batter/paste using little water, do not make thin consistency, make thick but pourable texture. Remove it into the big vessel or big mixing bowl. Grind urad dal in the same mixer bowl and make smooth paste using little water. Add grinded urad dal paste into the rice batter, stir it, mix it well, cover it and keep aside in warm place for 6-7 hours or overnight till fermented. After fermentation, add salt, pinch of soda and keep aside. Heat oil in a pan/kadhai, add mustard seeds, cumin seeds, pinch of hing and then add urad dal, broken cashew nuts, chopped green chilies, curry leaves and stir it for few seconds. Now add chopped onions, stir it till golden brown and then add grated ginger, grated carrot, again stir it for 2 minutes on medium flame. Add chopped coriander leaves, chopped potatoes cubes, turmeric powder, red chili powder, salt, sprinkle 1-2 tbsp water, mash the potatoes little bit, mix it well and cook it for 2-3 minutes. Potato masala is ready, keep aside for serving with dosa. Heat an iron griddle/nonstick flat pan on medium flame to make dosa. Take the prepared batter mixture and mix it well with ladle or big spoon. Now grease the griddle/pan with few drops of oil, then sprinkle few drops of water over the griddle, you can see the steamy bubbles, it should sizzle immediately. Spread 1 tsp of butter or ghee on the edges of the dosa and cook it till golden brown, crispy down side. Now spread the prepared aloo masala evenly over the dosa using a spatula as per your choice and Fold over while pressing it lightly, using a spatula to make a flat roll, repeat with the remaining ingredients to make more dosa. Masala Dosa is ready, serve hot, crispy dosa with sambar, coconut chutney or tomato chutney. Looks delicious! I love dosa as well the potato masala. I wonder what are the two sauces (orange and yellow) on the right. All together looks very attractive. I also love the “cone” dosa! Love your arrangement! thanks Artandkitchen! these are sambar(lentil soup) and tomato chutney! Thanks a lot for the recipes! I will have a look!